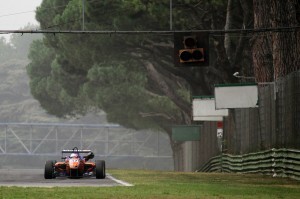 Felix will start the opening FIA Formula 3 European Championship race of the weekend at Imola from fifth on the grid, after an untimely red-flag stoppage forced him to abandon a charge for pole position in the closing stages of Friday qualifying. The grid-deciding session served to further emphasise the challenges of the Autodromo Enzo e Dino Ferrari, on a week so far littered with off-track excursions. After a sequence of red flags throughout testing and practice, it wasn’t long until qualifying followed the same pattern, with Sean Gelael spinning off at Variante Villeneuve with seven minutes remaining. As the session restarted, Felix (sitting fifth after the first runs) worked himself more and more into contention, and had just set a personal best – just fractions off pace-setter Esteban Ocon’s benchmark – through the first two sectors when the red flags flew again as Alexander Toril crashed his ThreeBond with T-Sport machine on the exit of Rivazza. Felix had to abandon his lap (as did many others) and, with just two minutes remaining, there would be no further improvements barring a last-second flyer from Jordan King that took the Englishman up to third. Ocon held on to pole on home soil for Prema Powerteam, with Italian favourite Antonio Giovinazzi second*. Behind King, Tom Blomqvist followed in fourth, with Max Verstappen fifth – just one hundredth of a second ahead of Felix in sixth. Verstappen, however, will have to serve a ten-place grid penalty for the first two races of this weekend following an engine change at the last round in Germany, leaving the Toro Rosso F1-man-to-be 15th and promoting Felix to fifth. Felix spearheaded the Mücke Motorsport armada, with Lucas Auer next up for the Berlin squad in ninth and Roy Nissany struggling to 20th. Race 1 is set to be run tomorrow morning. *NOTE: After the session, Giovinazzi also picked up a penalty, dropping the Italian three places on the Race 1 grid. As a result, Felix will start the race from fourth, one slot ahead of Giovinazzi.